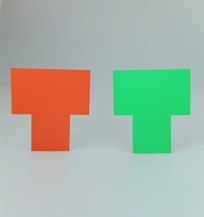 Printed red and green tee cards 70mm x 75mm for use in daily task boards (Kamishibai) with large top tab area for task information. Red Green Tee Cards Large Tab has been added to your cart. Go to shopping cart. Manage your every day tasks using this simple visual lean manufacturing tool. See also Red Green Task (Kamishibai) Rack. Office Tee Cards are an excellent lean tool for 5S tasks, operator autonomous maintenance tasks and every day office tasks.